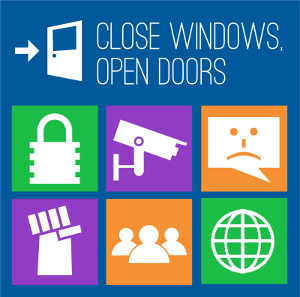 The widely-accepted failure of Windows 8 is a critical moment for the free software movement. Windows 8 is officially a flop. Despite attempts to force people to use the operating system by shipping restricted boot on new Windows 8 tablets and phones, not to mention a record smashing advertising budget, sales have been sluggish. What we have here is our best opportunity yet to help people give up Windows in favor of an operating system that respects our freedoms to choose, share, change, and view the code we use to conduct our digital lives.Microsoft wants to keep you locked in to Windows so that it can take your money, your personal data, and your user freedom. They don’t want you to know that you have a choice of better operating systems; operating systems that respect your freedom. There are tons of free “as in freedom” software operating systems that you can download and install at no cost. And when they’re improved, you can choose whether or not you want to upgrade, without a corporation breathing down your neck. It is time to upgrade your computer, but not to Windows 8, free your computer today! Edward Snowden’s leaks reveal that Microsoft has been helping the NSA circumvent encryption for online services like SkyDrive, Outlook.com, and Hotmail, Microsoft is intercepting our stuff and sending it to the NSA, the CIA and the FBI). Microsoft has been promoting its online services heavily, especially since the launch of Windows 8, which integrates web-based file storage and email into the operating system. Microsoft has touted the convenience of storing all of your data on their servers, all while criticizing competitors like Google for violating users’ privacy by indexing your searches and emails to target advertising. Meanwhile, Microsoft is encouraging users to switch to hosted services and then handing the contents of your emails and documents over the NSA (which is in turn handing it over to the FBI and the CIA). Those who are worried about getting “Scroogled” should know that getting “Microshafted” is no better. When you use a proprietary operating system like Windows, you are being funneled into a work flow that makes it easy for the NSA to intercept your communications and access your stored files. And as with all proprietary software, you have no way of knowing what the software you’re using is doing with your data; it took an internal leak to discover that Microsoft wrote code to assist secret government surveillance programs. When you use free software, you, or any knowledgeable member of the public, have the ability to look under the hood to see if there is any such code. Encrypt your emails, using free software encryption and a desktop mail client like Thunderbird. Proprietary encryption that’s done on a third-party server will not protect you if that third party is working with the NSA. But if you encrypt your email before it leaves your computer, Outlook.com or Gmail will never have the unencrypted version, so they can’t give it to the NSA. Switch to GNU/Linux, and stop using Microsoft and Apple products. Proprietary software is bad for your freedom and privacy in many ways, from leaky security to deliberate backdoors for the NSA. With a free software operating system, you have complete control over your computer. Looking for a free software GNU/Linux distribution? See our list of GNU/Linux distributions. If you already use GNU/Linux? Join the Stop Watching Us coalition in calling for a full congressional investigation. We deserve to know what else the NSA is collecting about our digital lives, and how. Learn more about PRISM and the actions you can take to protect yourself and take a stand against the intelligence-industrial complex. This entry was posted in Campaigns and tagged Debian, Edward Snowden, Free Software, Free Software Foundation, GCHQ, Microsoft, Microsoft Windows, Microsoft Windows 8, NSA, Prism, Tempora, Ubuntu by tamesidegreens. Bookmark the permalink.